guys, i’m fortunate to have a farmers field on my doorstep to use exclusively. It does have one flaw though and it’s a major one. It is on the top of a hill and slopes away on three sides - the other side is fenced off ! Landing is always a challenge and I am constantly practicing but again today, first flight, landing gear ripped off - trying to land up the slope. So, are there any tips or techniques I could try? How do you land a power plane on a slope? I fly at home on the farm,the field I use has a steep slope and can be quite rough at times. Mostly I fly hand launch/ belly land types and landing I have found is best done into wind no matter what direction the slope is except if wind is up the slope.Then it is time to get the slope soarer out. I do fly a couple of UC types there one being an old Limbo dancer fitted with a carbon UC on a strengthened belly plate.Being capable of slow flight I can plonk it down anywhere. On You tube you can see full size types landing in mountains and see they fly parallel to the ground before touch down even if that is up a steep slope.Perhaps practice low passes up the slope before going for a landing. Hope this helps. John. You need to approach a bit faster than you would on the flat and time the flare well! The rapid deceleration after touchdown means that you won't need to worry about rolling on too far from the faster than normal approach speed, the excess energy of which will allow a small margin to manage a very short hold-off..
Edit: I've just read JD8's advice which looks great and obviously draws on direct experience except that the standard advice for full sized gliding when outlanding was to always land up the hill if faced with the only choice of landing in a sloping field. Having learnt at Dunstable, up-slope landings were second nature but visiting pilots were often rather shocked when they saw the undulations! I don't think one can be too prescriptive about this, as the type of model has a bearing but generally speaking if the landing zone is restrictive you need excess speed on the approach like you need a hole in the head! Any excess speed will need to be 'bled off', as carrying extra speed and driving the model onto the ground at flying speed will not end happily (particularly if the ground is rough). A slow, powered approach, is more effective at producing an accurate short field landing but obviously care is needed to avoid a stall on the approach. This is where a model with a thick, blunt, wing section (like a Limbo Dancer) comes into it's own, as it is likely to be far more forgiving. Likewise, lots of wing area and a low wing loading, to give good low speed handling is desirable. Similarly, flaps when fitted, will increase the wing camber so that the wing produces the same amount of lift but at a lower airspeed. Equally important will be the increased drag these flaps produce, which, when countered with more thrust, will control the rate of decent more accurately than a glide approach. Watch any bush plane land on the side of a hill to see what I mean. Don't try this with your heavy, clipped-wing, Reno Racer however, as like I say, one can't be perscriptive! So what model are you currently flying onto your hilltop site Rich? Whatever you fly, modifying the landing gear so that it has large wheels and plenty of 'give' is not a bad idea. Some suggestions of 'good models' for short field landing might be (in no particular order); Ruhig Tiger, Wot 4, Maricardo, Basic 3D, Super Sixty? Any other suggestions anybody? I once had the opposite problem. I had permission to fly in a farmer's field where the slope faced into the prevailing wind! The model was a double sized Vic Smeed Tomboy and however much I forced it down the distance between the ground and the model constantly increased. In the end I landed it in a tree! Mind you I was a very inexperienced and incompetent pilot in those days! As Martin says full size practice is to land up slope,the length of wings preclude landing across the slope but at model size it is not such a problem.The model does tend to turn down the hill after touchdown but have found this better than trying to land crosswind and up hill which is hard to judge. I converted my old Hiboy trainer into a bush plane,alloy UC, push chair wheels,the nose wheel became the fixed tail wheel, larger wing from a Rojair trainer, Irvine 46 for power and a larger rudder to keep it on course during take off. Had it out of the attic the other day and had a good blast. I agree absolutely on the powered approach being best for a short landing but in a case where you're landing up a significant slope, some extra speed coupled with power allows you to flare and hold off sufficiently to allow a soft landing unless the model is forgiving enough to allow a harrier-like approach. I'm assuming that Rich's field is not on a gentle incline as this wouldn't produce the type of difficulty he appears to be encountering, hence the advice to come in somewhat faster than ideal for a flat field. That speed will bleed off very quickly while holding off up the slope and during any ground roll. I did put the theory to the test in a very awkward Welsh valley with the weather closing in, where the field I opted for on the side of the hill was quite short with a steep slope up to a small plateau - I just had enough energy to roll onto the flattish area which would have been much too short for a conventional landing. I do appreciate that the availability of an engine would have allowed a slightly slower approach though. I went back the next morning in the back seat of a Super Cub and a well briefed tug pilot who repeated the exercise before towing me out in the opposite direction - with tremendous acceleration back down the hill and the shortest take off run I ever did! I'm not sure why a model should be any different to the full size on any given angle of cross slope but certainly the ground clearance at the tips of a typical mid-winged glider would be a major consideration on a significant slope . Whatever you were trying to land across a decent slope, the bank would be trying to turn the model down it and you'd need to side slip across it with a last moment kick of rudder to land without a lot of drift. I don't think I'd like to try doing that myself! On balance (no pun intended) I think I would always opt for the up slope landing. Just to add another dimension to this - if you take up slope soaring for a year or so, you’ll soon feel much more confident about landing on uneven or sloping terrain. Thanks guys. 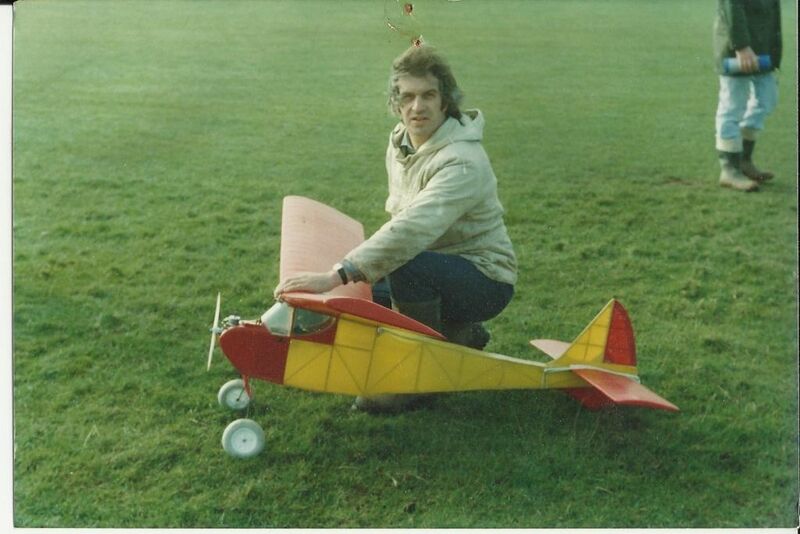 I fly mainly 20-70cc petrol models, Yaks, Edge, Wots Wot, etc. I use large wheels and c/f u/c on most. The Yak that had a hard landing on Sunday has plastic u/c bolts that have saved the model lots of times...I’ll take all the comments on board and practice, practice, practice !! Simple - just fly a Nutball. David, More details please on your Nutball. Plan/kit availability, power and control requirements. it reminds me of a model which I think was called the Floating Kidney featured in Aeromodeller many years ago which I fancied but never got round to building. Malcolm, there is a huge thread on the Nutball on RCGroups - everything you could ever want to know about the design is on there somewhere - just use the 'search' facility on the thread. wow theres 1200 pages over 10 years !!!!! I know... it is crazy popular! But almost everything you need to know is on the first two pages.